Russia shifted the focus of its air campaign from northwestern to eastern Syria from January 14 – 25 in support of pro-regime forces vying to repel a major ISIS offensive against Deir ez Zour City. Prior to the start of that offensive, however, Russia conducted aggressive air operations against opposition terrain in southern Idlib and western Aleppo Provinces from January 12 – 13, continuing to flout the nationwide ‘ceasefire’ agreement that Russia brokered with Turkey and Iran on December 28. These operations demonstrate Russia’s commitment to set conditions for pro-regime forces to clear the suburbs of Aleppo City and thereby strengthen their hold over Syria’s largest urban center. Then, on January 14, ISIS mounted an offensive against pro-regime forces in Deir ez Zour City, severing the pro-regime ground line of communication linking regime-held districts in the western half of the city to the Deir ez Zour Military Airport two days later. In response to the jihadist group’s gains, Russia conducted heavy waves of airstrikes against ISIS in Deir ez Zour City and its environs from January 14 – 17, intensifying its operations even further from January 18 – 25 amidst concerted pro-regime ground efforts to relieve the besieged airport. In support of those efforts, Russian Tu-22 strategic bombers conducted airstrikes against ISIS in Deir ez Zour Province after taking off from Russia and transiting Iraqi and Iranian airspace on January 21 and 23 – 25, according to the Russian Ministry of Defense. Meanwhile, Russian warplanes also targeted ISIS sanctuaries in eastern Homs and Hama Provinces, including the city of Palmyra. The dramatic surge in Russian airstrikes against ISIS, however, does not suggest that Russia can be a reliable partner for the U.S. against Salafi-jihadist groups. 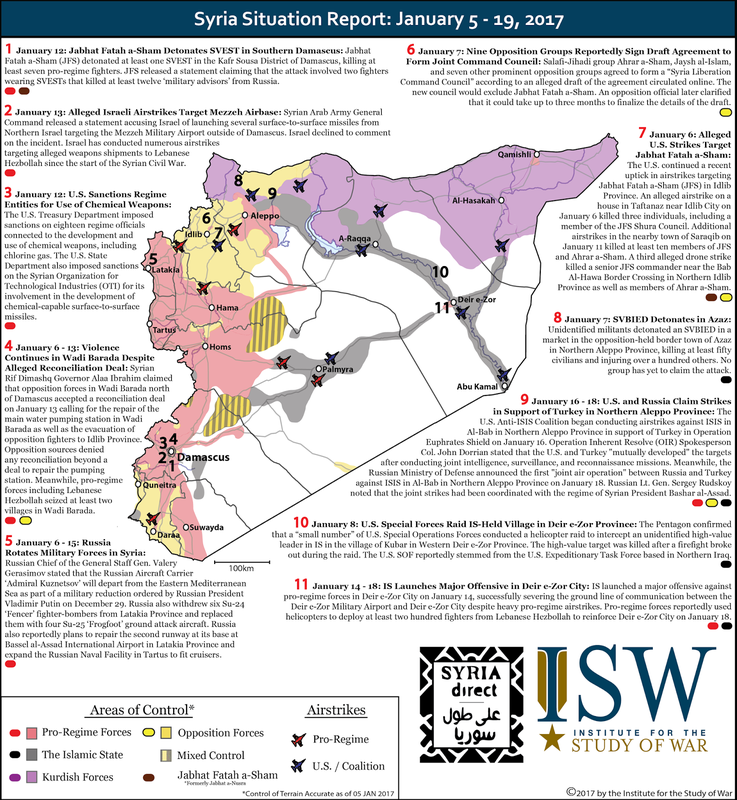 Rather, the surge reflects Russia’s strategic interest in bolstering the claim of Syrian President Bashar al Assad over all of Syria and maintaining a foothold in the Euphrates River valley from which to launch future operations into western Iraq. 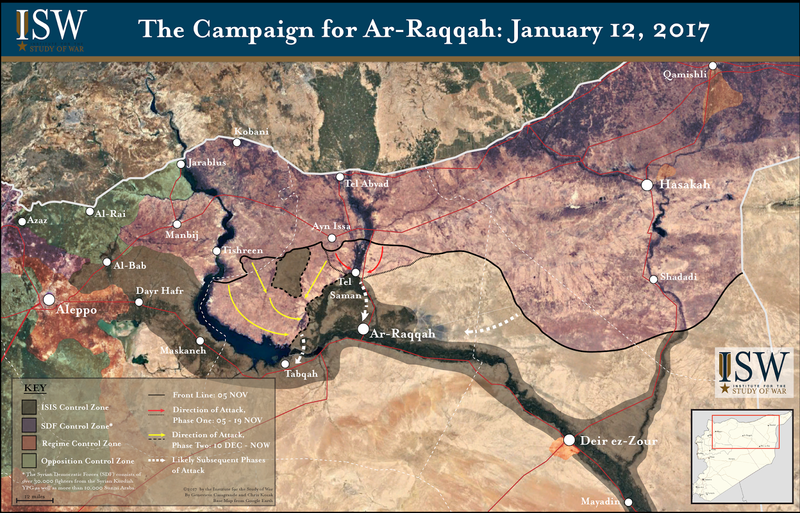 Although the ISIS offensive precipitated a shift in the focal point of the Russian air campaign in Syria, that shift will be a temporary one. Once militarily practicable, Russia will renew its air operations against the acceptable opposition in northwestern Syria in order to further constrain U.S. options for engagement in the Syrian Civil War. The recapture of Mosul can reset the balance of power between Iran and the U.S. in Iraq and in the region. Iran has tolerated U.S. presence in Iraq because the U.S. provided sufficient airpower and training to combat ISIS. It has also backed Prime Minister Haidar al-Abadi because his premiership was a condition of U.S. support and because PM Abadi is too weak to resist Iranian control. 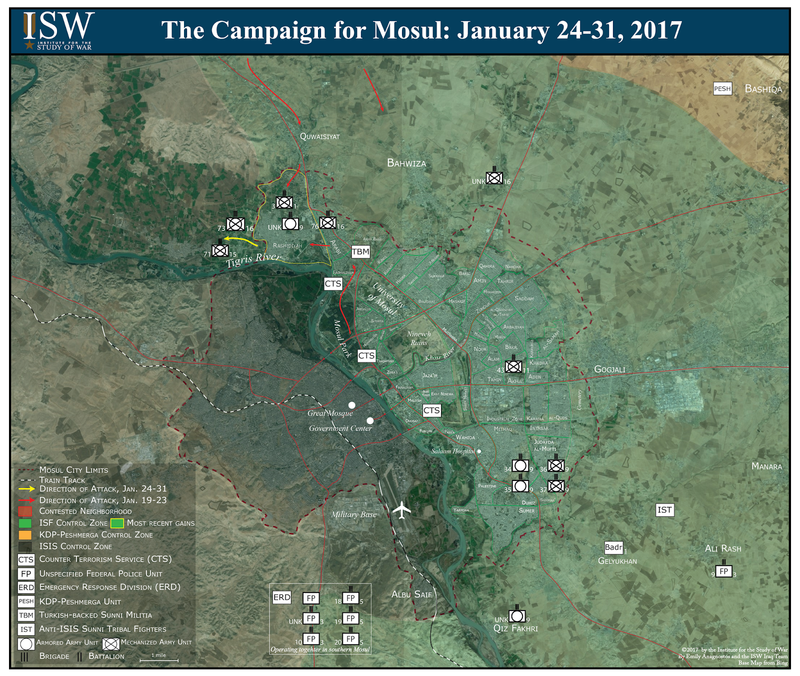 Pro-Iranian groups in Iraq will likely consider the recapture of Mosul as the end of major anti-ISIS operations in Iraq and continued U.S. presence unnecessary and unwelcomed. Recent U.S. statements suggest that the U.S. may increase, not decrease, its involvement in Iraq after Mosul, which is likely accelerating Iran’s efforts to expel the U.S. from the region. Iran has started to consolidate its proxies in Iraq, including a reconciliation between Sadrist Trend leader Muqtada al-Sadr and senior pro-Iranian officials, in order to both increase pressure on PM Abadi against further Western support and establish Iraq as a base from which it can project regional influence. Iran’s support for PM Abadi’s premiership could also waver, especially if a more pro-Iranian candidate emerges. Former PM Nouri al-Maliki will aim to convince Iran that he, as prime minister, would support the power shift from the U.S. to Iran in order to secure Iran’s political support for 2018 parliamentary elections. Maliki has begun to court Iranian proxies and officials and is continuing to weaken PM Abadi’s authority, including by resuming efforts to dismiss key Abadi allies. More dangerously, he may move to retake the premiership in the upcoming month. The Council of Representatives (CoR) scheduled a questioning session with PM Abadi on February 11, alongside ten other government officials over the coming month. The questioning could be a prerequisite for a no-confidence vote. At the very least, the questioning will be a show of strength for Maliki and could undermine PM Abadi’s legitimacy. 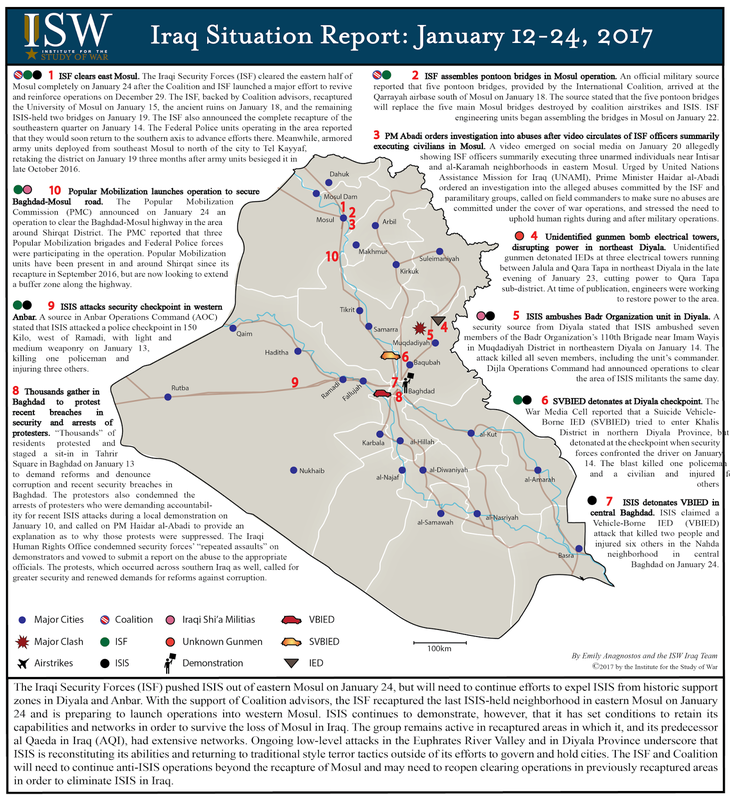 The Iraqi Security Forces (ISF) recaptured eastern Mosul on January 24. 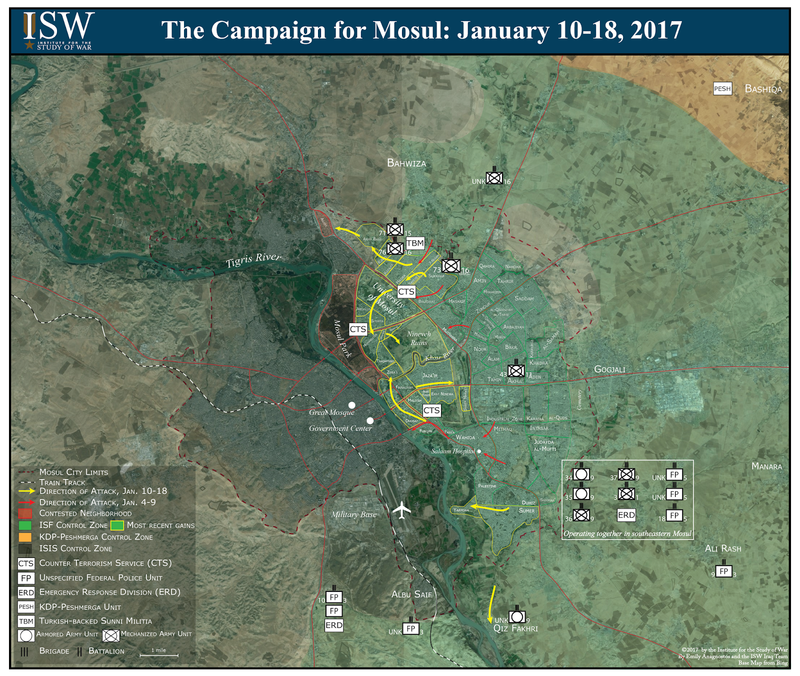 Operations to retake western Mosul will begin in the coming days, with heavy support from the U.S. and the anti-ISIS Coalition to ensure the city’s complete recapture. Iranian grand strategic objectives converged with the U.S. in the near term over the shared objective to defeat the Salafi-Jihadi threat. In the long term, however, Iran aims to expel the U.S. from the Middle East. The U.S. and Iran both supported PM Abadi’s premiership in 2014 over Maliki in the interest of re-stabilizing Iraq and defeating ISIS. They both prevented Maliki from ousting PM Abadi in the midst of political turmoil in April 2016. The U.S. provided anti-ISIS support, including critical airpower, on the condition that Maliki would not bid for a third term in 2014 elections. The U.S. supported PM Abadi as a candidate receptive to U.S. interests. Iran supported him because he was a weak candidate it can control. The longevity of PM Abadi’s premiership, therefore, is linked to the necessity of U.S. military support to defeat ISIS, which Iran’s military capacity was and still is unable to duplicate, and Iran’s confidence that it controls the premiership. U.S. involvement in Iraq may increase, not decrease, after Mosul’s recapture. Sadrist Trend leader Muqtada al-Sadr reconciled with major Iranian proxy militia leaders, including Badr Organization leader Hadi al-Amiri, Asa’ib Ahl al-Haq (AAH) leader Qais al-Khazali, and Popular Mobilization Deputy Chairman Abu Mahdi al-Muhandis, in Najaf on October 18, 2016. Sadr’s interests in Iraq have long been distinct from, and often at odds with, Iranian interests and he, his militia, and political party rarely operate in coordination with pro-Iranian groups. (Do not enter: jawabna.com) Bringing Sadr back under Iran’s fold consolidates the major Shi’a groups in Iraq and creates a unified proxy through which Iran can act. The passing of the Popular Mobilization Act on November 26, 2016 further institutionalized Iranian proxy militias in the Iraqi state, but they continue to operate under Iran’s command and control. Popular Mobilization participation in anti-ISIS operations will cement Iranian presence in northern Iraq and the Popular Mobilization as a legitimate security force. Iran is also pursuing its objective to supplant the U.S. in the Middle East by using Iraq as a regional proxy. Muqtada al-Sadr visited Beirut on January 20 where he met with Hassan Nasrallah, the leader of Iranian proxy Hezbollah, to discuss both Hezbollah and Iraqi Shi’a militias’ influence in the region. On January 24, Sadr stated that the transfer of the U.S. Embassy in Israel from Tel Aviv to Jerusalem would be a “declaration of war against Islam” and he called for a formation of a “special division to liberate Jerusalem.” Sadr’s statement falls in line with the Iranian grand strategic objectives to eliminate the state of Israel and to expel the U.S from the region. Iran named IRGC Brig. Gen. Iraj Masjedi as Iranian Ambassador to Iraq on January 11. Masjedi is IRGC-Quds Force Commander Qassem Suleimani’s senior advisor. Previous ambassadors have also served in the Quds Force, but Masjedi’s relation with Qassem Suleimani, a U.S. designated terrorist, will likely strengthen Iran’s efforts to convert the Iraqi Government and its institutions into proxy forces. Iran may no longer value PM Abadi’s premiership as it did in 2014, when Abadi was necessary to ensure U.S. support, opening an opportunity for former PM Nouri al Maliki to bid for the premiership. Iran may consider it more preferable to have an Iraqi Prime Minister that actively pursues pro-Iranian interests, rather than a premiership that is receptive to the U.S. and merely too weak to resist Iran. Maliki, since he lost the premiership in 2014, has sought to return to the office by undermining PM Abadi’s office. Iran previously mitigated these ambitions through direct intervention. Maliki is courting Iranian proxy groups as an electoral base, likely on the promise to expel the U.S. from Iraq after Mosul’s recapture and shift the balance of power to Iran. A report on January 25 alleged that Maliki will contest PM Abadi’s reelection in 2018 by building an alliance of Shi’a militias, naming mid-level Iranian proxy militias as allies. Maliki chaired a meeting of the State of Law Alliance (SLA), his political bloc, on January 24, at which PM Abadi was not present. Iranian representatives were allegedly in attendance. Maliki conducted a four-day visit to Tehran from December 31, 2016 to January 3, 2017, meeting with senior Iranian officials, including Supreme Leader Grand Ayatollah Ali Khamenei, during which he discussed elections and the Popular Mobilization’s involvement in the region. PM Abadi faces a questioning by the Council of Representatives (COR) on February 11. The CoR released a list on January 24 of eleven ministers, independent commission chairmen, and senior government officials that will be questioned over the next month. PM Abadi is the fifth of the eleven officials to be questioned. The list also includes three of the five technocratic ministers that PM Abadi succeeded in appointing during his Cabinet reshuffle in August 2016, including the Oil Minister, Water Minister, and Transportation Minister. PM Abadi’s questioning will reportedly be about recent security breaches in Baghdad and vacant ministerial positions. Protests, including those led by the Sadrist Trend, have occurred in response to continued ISIS attacks in the capital. Pro-Maliki CoR members will lead the majority of the questioning sessions, as they did during sessions to dismiss Finance Minister Hoshyar Zebari on September 21, 2016 and Defense Minister Khalid al-Obeidi on August 25, 2016. A member of Gorran, a Kurdish opposition party, will question PM Abadi, however. The Iraqi Constitution (Article 7.A-C) lists two types of questioning sessions: one of which is for the sake of inquiry into a subject and one of which is the first step in a no-confidence vote. The latter requires a petition of 25 CoR members to launch the questioning session. It is unclear if these questionings were petitioned. Nevertheless, the dismissal of both the Finance and Defense Ministers did not follow constitutional procedure, underscoring the danger that the questioning, even if it is framed as a basic inquiry, may be considered the first step of a no-confidence vote. Maliki’s efforts to replace PM Abadi and the lack of Iranian support may place PM Abadi’s position in double jeopardy. PM Abadi’s questioning on February 11 may set the stage for a no-confidence process. But Maliki will need to ensure that he has the needed votes and backing to become prime minister. He continues to hold wide support within the Shi’a National Alliance, but far from a majority in the CoR. Indicators of whether the questioning will lead to a no-confidence vote will include how Kurdish and Sunni parties throw their weight. Maliki courted Kurdish parties, primarily the Patriotic Union of Kurdistan and Gorran, in April and May 2016, but he has made limited outreach to these parties in the past months. If Maliki does not have the votes, he may instead choose to use PM Abadi’s session as a rallying call for further support, continue efforts to weaken PM Abadi’s authority, and build an electoral support base over the next year. The Iraqi Security Forces (ISF) pushed ISIS out of eastern Mosul on January 24, but will need to continue efforts to expel ISIS from historic support zones in Diyala and Anbar. 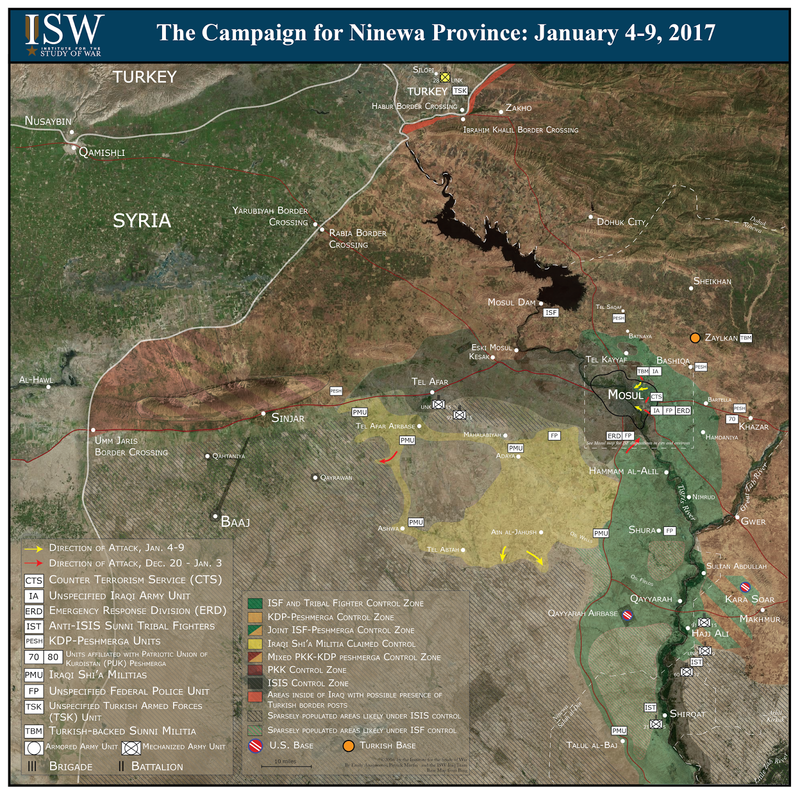 With the support of Coalition advisors, the ISF recaptured the last ISIS-held neighborhood in eastern Mosul on January 24 and is preparing to launch operations into western Mosul. 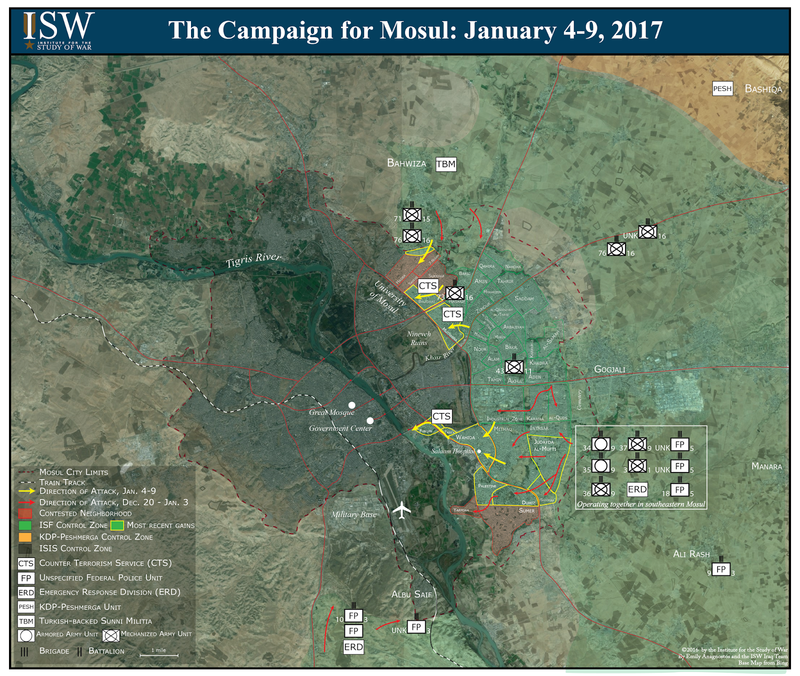 ISIS continues to demonstrate, however, that it has set conditions to retain its capabilities and networks in order to survive the loss of Mosul in Iraq. 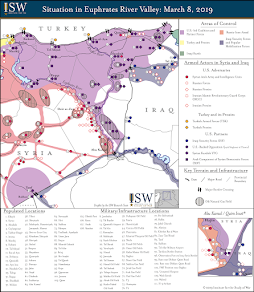 The group remains active in recaptured areas in which it, and its predecessor al Qaeda in Iraq (AQI), had extensive networks. 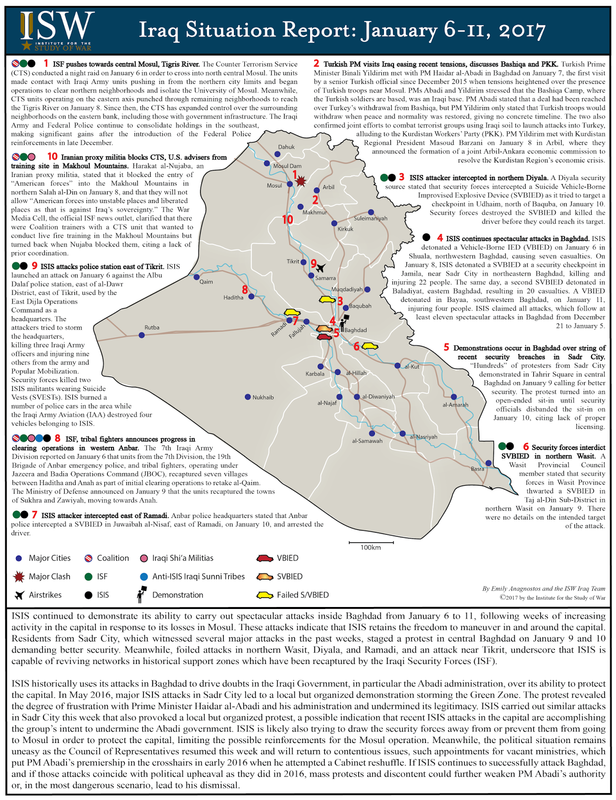 Ongoing low-level attacks in the Euphrates River Valley and in Diyala Province underscore that ISIS is reconstituting its abilities and returning to traditional style terror tactics outside of its efforts to govern and hold cities. The ISF and Coalition will need to continue anti-ISIS operations beyond the recapture of Mosul and may need to reopen clearing operations in previously recaptured areas in order to eliminate ISIS in Iraq. 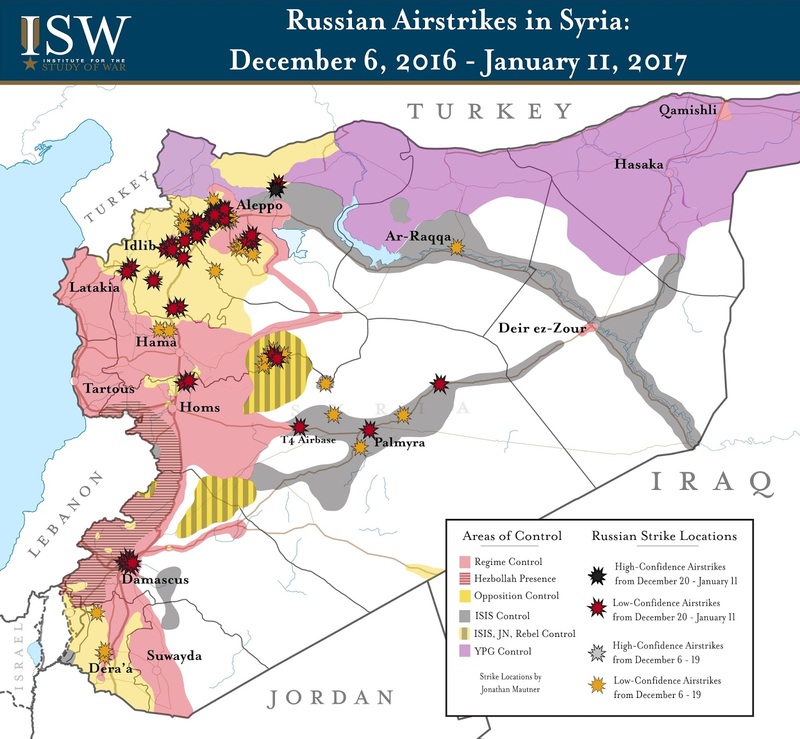 Russia continued to wage an aggressive air campaign in Syria from December 20, 2016 – January 11, 2017 despite announcing a ceasefire and military drawdown in the country. 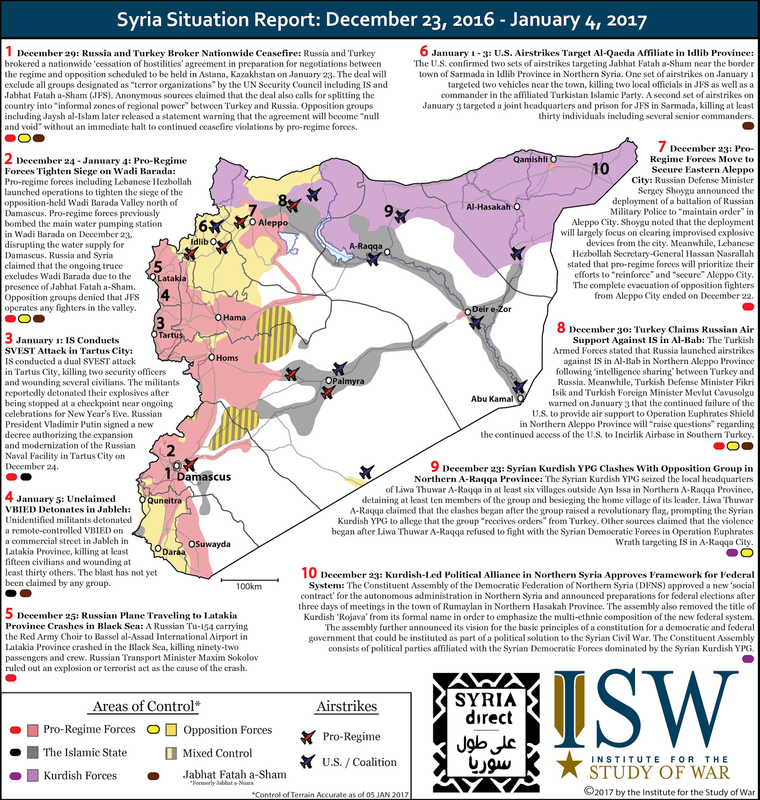 Russia and Turkey brokered a ‘nationwide’ ceasefire on December 28 that took effect one day later, nominally securing the participation of the Syrian government but excluding ISIS and Jabhat Fatah al Sham (JFS), successor of al-Qaeda’s Syrian affiliate, Jabhat al Nusra. At the same time, thirteen various armed opposition factions reiterated their support for a cessation of hostilities, conditioning their assent on the regime’s compliance. Notwithstanding its negotiations with Turkey, Russia conducted heavy waves of airstrikes against at least five opposition towns in the besieged Eastern Ghouta suburbs of Damascus from December 28 – 29, aiming to bolster the pro-regime siege-and-starve campaign near the Syrian capital in advance of the ceasefire. 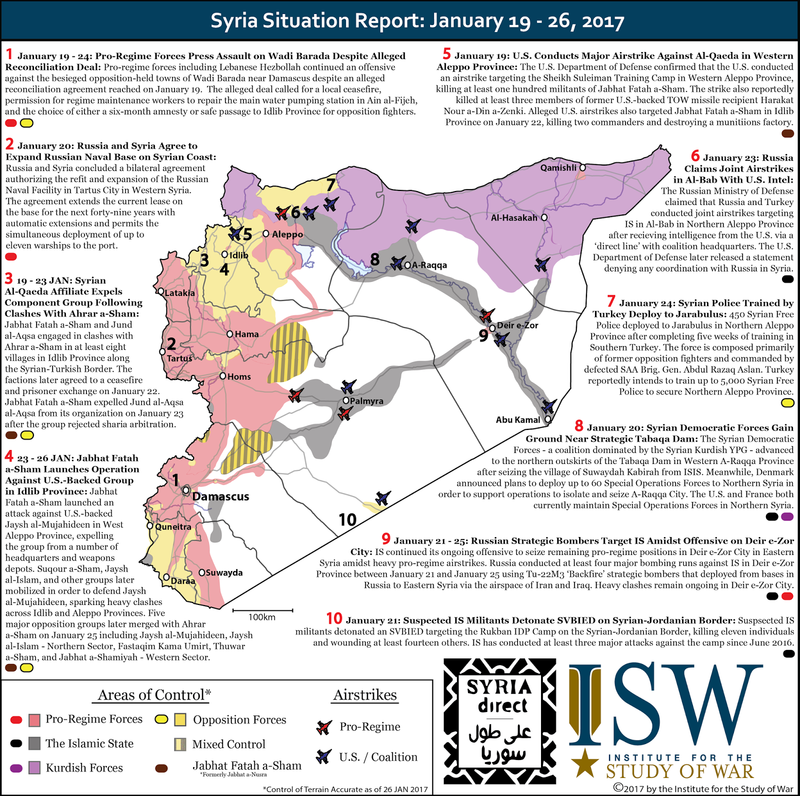 Russian warplanes also aggressively targeted opposition terrain west and south of Aleppo City from December 22 – January 2 and January 9 – 11, setting conditions for pro-regime forces to clear the city’s outlying suburbs and thereby strengthen their hold over its recently recaptured eastern districts. Russia’s continuing air operations in the wake of the evacuation of Aleppo City on December 22 indicate that Russia will continue to take military action to achieve its strategic objectives in Syria, including the consolidation of regime control over the country’s major urban centers. Russia will likely exploit the exclusion of JFS from the ceasefire in order to continue its targeting of acceptable opposition forces that cooperate and collocate with JFS out of military necessity. Russia also conducted airstrikes against ISIS-held terrain in the vicinity of Palmyra in eastern Homs Province from December 20 – January 11 in order to defend the nearby T4 (Tiyas) Airbase, its main base of operations in central Syria. The primary target of the Russian air campaign during this period remained the acceptable opposition, however, demonstrating that the U.S. cannot rely upon Russia to invest heavily in anti-ISIS operations even when the jihadist group threatens core pro-regime interests. The commencement of the Russia-Turkey brokered ceasefire coincided with Russian President Vladimir Putin’s announcement that Russia will pursue a “reduction of [its] military presence” in Syria. Russia will likely use this period to prepare for a new phase of its military intervention in the country, however. Although Russia withdrew its lone aircraft carrier, the Admiral Kuznetsov, from the Syrian coast on January 6 and as many as six Su-24 bombers from Latakia Province in the following days, these withdrawals do not materially diminish Russia’s military capabilities in Syria. Pro-regime forces advanced into eastern Aleppo City despite the loss of at least two Russian airframes attempting to recover to the Kuznetsov from November 14 – December 3, suggesting that the carrier was neither highly functional nor militarily decisive during its deployment to Syria. Rather, Russia used the Kuznetsov to demonstrate its force projection capabilities, transferring some of its accompanying aircraft to the Bassel al Assad Airport in western Syria following the crashes. Whether by design or for operational safety, those transfers will help enable Russia to continue its aggressive air campaign moving forward. In an effort to refine that capability, the Russian Ministry of Defense also acted swiftly to replace the departing Su-24s, announcing the deployment of four Su-25 warplanes to the airbase on January 12. 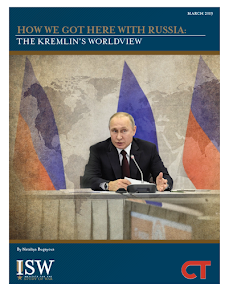 The deployment of the Su-25s — a more effective ground attack aircraft than the ageing Su-24s — indicates that Russia will use the guise of its purported drawdown in order to rotate out dated airframes in favor of assets that will better enable it to achieve the aims of future pro-regime operations. Russia’s deployment of a military police battalion to Aleppo City on December 22 suggests that those operations may include a concerted effort to clear the city of any opposition fighters who remain in the wake of its evacuation. 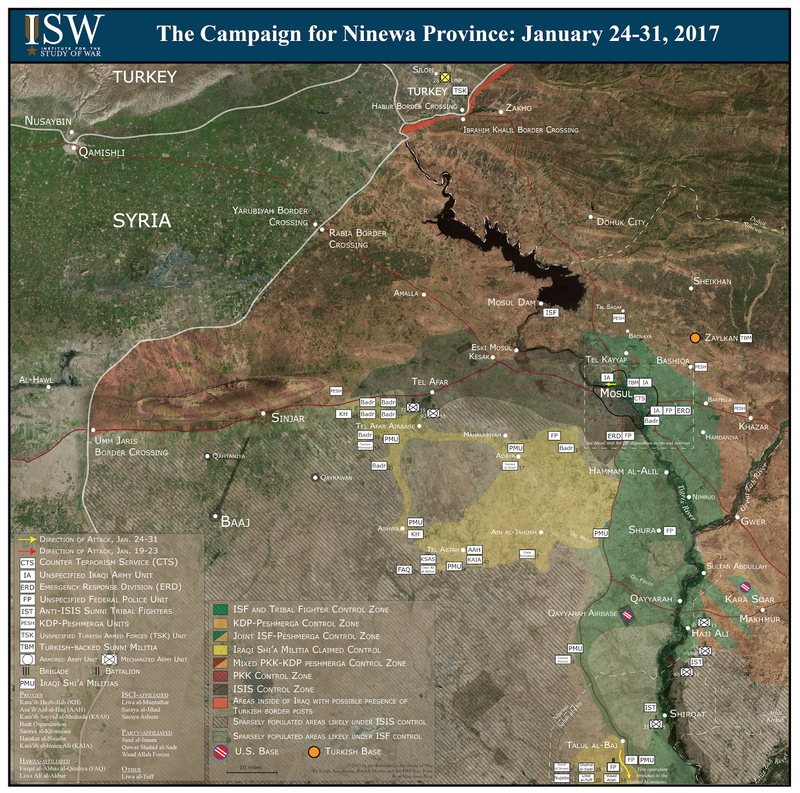 Whatever their respective missions, the recent deployments of military police, more capable attack aircraft, and new military vehicles to Syria following the Russian drawdown announcement all but confirm that the pro-regime alliance will not simply abandon its pursuit of territorial gain in the Syrian Civil War.